The Estates 34-inch x 28-inch Framed Mirror in Antique White features a beveled-edge mirror within a decorative, handcrafted birch wood frame. Designed to add a touch of luxury to your bathroom decor and coordinates with the Estates Vanity. The mirror features a wall cleat for easy hanging. A rectangular wood frame mirror, made with solid birch wood in white finish. It is warm and sophisticated to add to any bathroom. The mirror is a high quality 0.6-inch thick mirror prevent rusting against bathroom humidity. All mounting hardware included. Mirror Dimension: 30-inch W x 1-inch D x 36-inch H.
The mirror is built in solid wood frame construction, durable and sleek. Mirror comes with high quality 0.6-inch thick mirror glass to prevent rusting against bathroom humidity. The mirror frame is made of birch in black finished. Mirror comes fully assembled for fast and easy installation; no assembly required. Chic and charming, the beautiful Foremost Cottage Wall Mirror in Antique White features a poplar-framed design with a premium antique white finish to brighten up a variety of bathroom styles. A decorative shelf installs on the bottom of the mirror, providing a convenient surface for small collectibles or bathroom accessories. The solid wood frame offers a pre-attached hanger mount for quick, easy installation with included hardware. The Fresca Bradford Gray Bathroom Mirror has a simple rectangular silhouette that adds an airy elegance to any space. With a solid wood frame and water resistant finish, It measures 20"W x 30"H x 1"D and comes with mounting hardware. Available in several colours, this mirror is a perfect match for the Fresca Bradford Vanity line. Estates 34-inch L x 28-inch W Wall Mirror in Antique White The Estates 34-inch x 28-inch Framed Mirror in Antique White features a beveled-edge mirror within a decorative, handcrafted birch wood frame. Designed to add a touch of luxury to your bathroom decor and coordinates with the Estates Vanity. The mirror features a wall cleat for easy hanging. 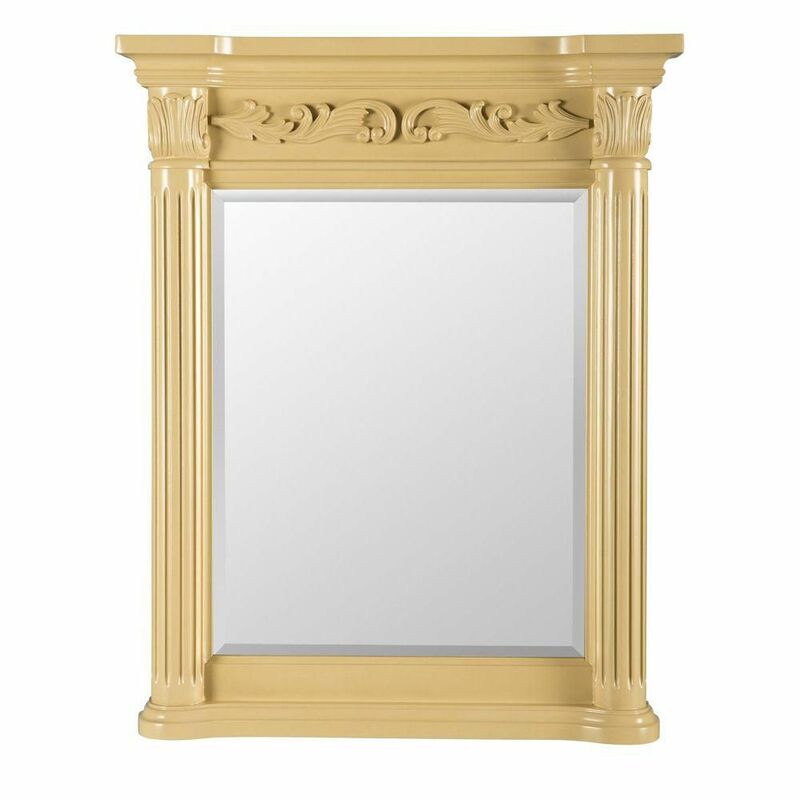 Estates 34-inch L x 28-inch W Wall Mirror in Antique White is rated 4.5 out of 5 by 11. Rated 3 out of 5 by Francisco from The matching mirror design carvings looks great, but the painting... The matching mirror design carvings looks great, but the painting quality and color could have been done better. Hinges and latches are great! Height is little high about 1"higher than standard. Should have been done adjustable height or at least 34" ht. max. The vanity looks great with the matching mirror though. Rated 5 out of 5 by Peggy1954 from So pretty - it matches the vanity I bought this awhile ago. It’s pretty and very detailed . Rated 4 out of 5 by NiceTrimmer from I like it and also bought the matching vanity. Both pieces are currently being refinished b/c the... I like it and also bought the matching vanity. Both pieces are currently being refinished b/c the color is AWFUL. It is decidedly YELLOW like spicy mustard, not antique white. I like the pieces enough to spend about $500 to correct the color, but you should be aware. Rated 5 out of 5 by Bathroom12 from Very Elegant! This mirror with the matching vanity looks awesome. Completely changed my bathroom. Rated 4 out of 5 by SusanA from a Beautiful piece of furniture It's an elegant-looking piece and I was thrilled to have found it to match my bathroom sink/vanity. Rated 4 out of 5 by charley48 from Great Furniture Piece The antique white was really a light gold. We had to refinish it to match what we have.